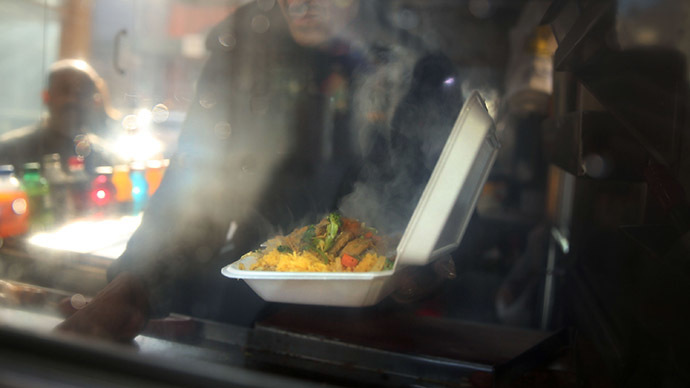 New York City Mayor Bill de Blasio is moving forward on a plan to ban city food establishments from using plastic foam containers because of the harm they cause the environment. The ban will leave restaurateurs and food vendors in a bind. "These products cause real environmental harm and have no place in New York City," Mayor de Blasio said in a statement announcing the ban this week. "We have better options, better alternatives, and if more cities across the country follow our lead and institute similar bans, those alternatives will soon become more plentiful and will cost less." Under the foam container ban, polystyrene coffee cups and takeout containers will be outlawed. Packing peanuts will also be banned from being sold in the city, but they can still be placed in packages shipped to the city from elsewhere. The New York City Council passed the ban last year but gave the polystyrene industry a year to see if it could come up with a recycling program as an alternative. The costs, however, proved prohibitive. Restaurants are worried that the ban will stick them with higher operating costs as they scramble for an alternative material. The Restaurant Action Alliance lobbying group condemned the decision, suggesting that it would increase costs for eateries while saying that the city should instead focus on creating a plan to recycle the material. "The decision to ban foam food service products, which comprise only 10 percent of polystyrene foam material, will send the remaining 90 percent to landfills at the taxpayers' expense," the group said in a statement. The ban will start July 1 and administration officials said there will be a grace period, without fines, until January 2016. Administration officials said the ban will remove nearly 30,000 tons of expanded polystyrene from the city's streets, waterways and landfills. The ban will also build upon de Blasio's push to create a greener New York City. Last year, he announced an ambitious plan to cut its greenhouse gas emissions 80 percent by 2050 from its 2005 levels. "While much of the waste we produce can be recycled or reused, polystyrene foam is not one of those materials," Sanitation Commissioner Kathryn Garcia told the Associated Press. "Removing polystyrene from our waste stream is not only good for a greener, more sustainable New York, but also for the communities who are home to landfills receiving the city's trash."